A major fire has broken out at the famed Notre Dame Cathedral in central Paris, causing massive damage to the 12th-century building. 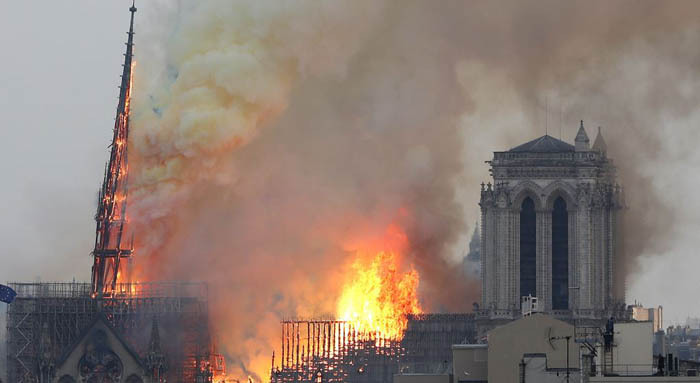 Media footage showed the cathedral in the French capital continuing to burn as night fell Monday, with flames leaping uncontrollably from the roof after the spire collapsed. A cathedral spokesman, Andre Finot, told French media the entire wooden interior of the cathedral is burning and likely to be destroyed. Paris Deputy Mayor Emmanuel Gregoire told BFM TV that workers were scrambling "to save all the artworks that can be saved." Hundreds of firefighters used water hoses to battle the blaze into the night. French police say no deaths have been reported. It is not clear if anyone has been hurt or what caused the blaze. French media reported that fire officials said the blaze could be "potentially linked" to renovation work being done at the building. Several sections of the building had been under scaffolding and officials say bronze statues were removed last week for the renovation. French President Emmanuel Macron tweeted, "Like all our compatriots, I am sad this evening to see this part of all of us burn." He canceled a planned policy address to the nation and visited the scene of the blaze. The Paris prosecutor's office said it had launched an inquiry into the fire. U.S. President Donald Trump tweeted, "So horrible to watch the massive fire at Notre Dame Cathedral in Paris. Perhaps flying water tankers could be used to put it out. Must act quickly!" U.S. first lady Melania Trump wrote on Twitter, "My heart breaks for the people of Paris after seeing the fire at Notre Dame Cathedral. Praying for everyone's safety."